As part of our continued coverage of the recently completed legislative session, we will be releasing a series of sit down interviews with key conservative legislators that had an impact on important issues during the session. Our 3rd interview is with Rep. Phil King. We talked with Rep. King about the important battle on the budget, including his leadership in efforts to cut spending, not raise taxes, and to protect the state’s rainy day fund. Yesterday, Gov. Rick Perry signed the 2012-2013 Texas budget. Here is the video of the press conference and ceremonial signing. Kelly Shackelford, President and CEO of Liberty Institute, participated in the ceremony and his comments can be found at around 15:35 of the video. Texas Legislative Update: Midnight Deadline Looms-Still Working!! 12:40 a.m. House adjourns without passing major budget related bill SB 23 and three other massive education, judiciary, and health care bills, HB 6, SB 1717, and SB 8. Senate adjourns after Sen. Wendy Davis uses filibuster to block SB 1811, a budget bill that was a “must pass”, so we’re now headed for a special session. 11:15 p.m. House fails to get 2/3rd vote on motion to extend Texas Leg deadline passed 12:00 a.m., SB 23, HB 6, and SB 1811 (Senate Dems using filibuster to stop this bill from passing), have the countdown started on them. Some noteworthy bills still await a final vote. Texting/reading text ban and “fiscal matters” bills (SB 1811 and SB 23) need to pass for budget to ‘work out”, to avoid a special session. HB 6 is also awaiting a final vote. More updates to follow. Very important updates to come later. Below find video of the entire press conference. 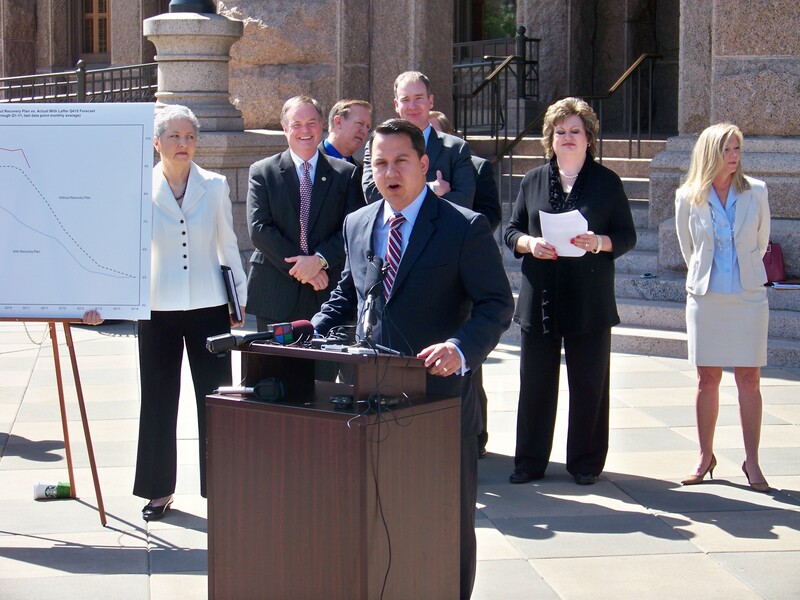 Update: Liberty Institute was proud to stand today with The Texas Public Policy Foundation, Americans for Prosperity-Texas, Americans for Tax Reform, Empower Texans, Heartland Institute, the National Federation for Independent Business-Texas, and members from Tea Parties from around the state in support of a conservative budget for the state of Texas. Today, Liberty Institute along with other conservative organizations, including The Texas Public Policy Foundation, Americans for Prosperity-Texas, Americans for Tax Reform, Empower Texans, and the National Federation for Independent Business-Texas, are hosting a joint press conference at 11 a.m. on the North Steps of the Capitol to encourage our legislators to cut non-essential programs, not raise taxes or fees, and not go back into the rainy day fund. Check back later today for pictures from the event. Last Friday, the Texas House passed a budget to live within our means, with no new taxes, during this tough time and also started the defunding of taxpayer dollars to Planned Parenthood. Led by numerous pro-life conservatives, the effort caused a seismic shift in the way tax dollars are used for “family planning” services. Although tax dollars cannot be used for elective abortions in Texas, Planned Parenthood is a major recipient of tax dollars for family planning services, keeping the government money stream alive and well for the well-known abortion provider. But all that changed on Friday, when the Texas House debated and voted on the Texas budget. Rep. Randy Weber led the effort to use family planning funds to restore funding for the Alternatives to Abortion program. Later Rep. Chisum, Rep. Morrison, and Rep. Burkett put into place a priority list of how family planning funds can be distributed, leaving entities like Planned Parenthood dead last. Numerous other amendments were passed as well that shifted money away from family planning services. All these efforts collectively mean that entities like Planned Parenthood may not receive any taxpayer funding under the 2012-13 budget. In last week’s Legislative Update video, I talked with Abby Johnson, former Planned Parenthood Director and now Pro-Life Advocate, about the impact of defunding Planned Parenthood. Weekly Legislative update video from the Texas Capitol.